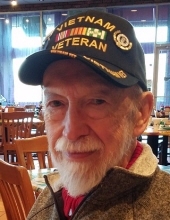 Fred Eugene Morris, Vietnam veteran, loving husband, big brother to 8, father of 2 and grandfather of 4 passed away on February 10, 2019. Known best as Poppie to those that loved him most, Fred spent his 84-plus years on this earth selflessly serving others. Fred was born in Oakdale, Kentucky on February 21, 1934 to parents Walter and Daisy Morris and was the first of 9 sons and daughters. The family moved to Brighton, Michigan where Fred graduated from Brighton High School in 1955. The day after graduation, Fred joined the United States Air Force and was eventually stationed at Malmstrom Air Force Base near Great Falls, Montana. While ice skating off-duty, Fred met Hermaine Luther, courted her and on June 30, 1960 the couple married, a union that lasted over 58 years. Their daughter, April Lynn Morris (Ifkovits) was born in Great Falls, Montana in 1962. Once discharged from the Air Force, Fred moved the family to Knoxville, Tennessee where he worked on the High Flux Isotope Reactor at Oak Ridge National Laboratory. In 1967, the family grew to 4 with the birth of their son, Ryan Luther Morris. Fred joined the National Guard while living in Knoxville and continued his service after moving to Woodbridge, Virginia. Soon after joining the Virginia guard, his unit was activated in response to the Tet Offensive. He served in-country from 1968 to 1969, stationed at Phu Cat Air Force Base. In total, Fred proudly serviced his country with distinction for 12 years of active duty rising to the rank of Technical Staff Sargent. After his service years, the family eventually moved to Jacksonville, Florida where Fred worked for the Federal Aviation Administration (FAA). Fred was one of two employees to earn entry into a tuition assistance program called Operation Bootstrap. The family moved to Atlanta, Georgia in 1973 so Fred could attend the Georgia Institute of Technology. Fred earned Dean’s List honors despite also working at the FAA and raising a family. In 1979 he graduated with a Bachelor’s degree in Electronic Engineering. Fred spent the rest of his career with the FAA but also taught night classes at DeKalb Tech. In 1990, he retired after a total of 40 years serving his country both as a airmen and a civilian. Fred remained active after retirement waking up early every day to go to the gym followed by pursuing his passions for gardening, genealogy, spending time with his grandchildren and traveling with his wife to visit family in Montana and Michigan. Fred is survived by his wife Hermaine Morris, daughter April Ifkovits, son Ryan Morris, son-in-law Philip Ifkovits, daughter-in-law Pamela Morris, grandsons Zachery Ifkovits, Nicholas Ifkovits and Ethan Morris, granddaughter Emily Grace Morris, brothers John Morris, Lonnie Morris, Danny Morris and sister Wilma Gray. He was proceeded in death by his parents Walter and Daisy Morris, brothers Frank Morris and Walter Morris Jr and sisters Kathy Oates and Joann Kimberley. In lieu of flowers, please consider a contribution in memory of Fred Morris to the Carrie Steele-Pitts Home ( http://csph.org/join-us/ ), 667 Fairburn Road, Atlanta, GA 30331. To send flowers or a remembrance gift to the family of Fred Eugene Morris, please visit our Tribute Store. "Email Address" would like to share the life celebration of Fred Eugene Morris. Click on the "link" to go to share a favorite memory or leave a condolence message for the family.